What is the best way to use PushSpring Data? PushSpring works with mapping partners to translate mobile in-app audiences to mobile web and desktop browser audiences. Use PushSpring data to target in-app users by IDFA and Android Advertising ID across Personas informed by device signals such as app ownership, location, and device settings. Use PushSpring data to target in-app users by IDFA and Android Advertising ID across all iOS and Android mobile devices, including tablets. How does PushSpring differ from other mobile data providers? PushSpring provides deterministic device-level targeting data for iOS and Android mobile app audiences. Target cross-device using Personas curated from IDFA and Android Advertising ID and create audiences informed by device signals such as app ownership, location, and device settings. PushSpring audience data is sourced from mobile apps. Target users based on their true mobile app interests and behaviors, not by a probabilistic ID match to offline or browser-based interests. All PushSpring data is processed to eliminate IDs associated with fraudulent traffic or app ownership patterns that are inconsistent with actual devices. Remove fraud from mobile campaigns by layering the entire PushSpring audience data set in your targeting criteria. Which data types does PushSpring offer? 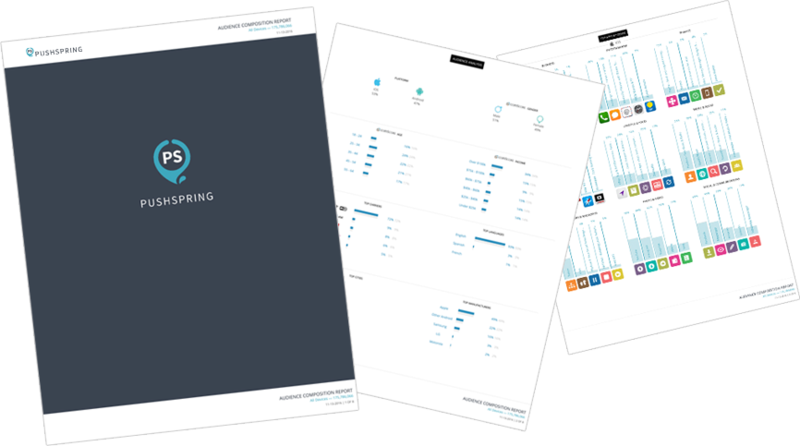 PushSpring provides device-level targeting data for verified, non-fraudulent, iOS and Android mobile app audiences. Use PushSpring data to target in-app users by IDFA and Android Advertising ID across Personas informed by device signals such as app ownership, location, and device settings. PushSpring audiences can also be used to target cross-device campaigns. Does PushSpring offer custom audiences? What are PushSpring Life Stage Personas? What are PushSpring Interest & Activity Personas? What are PushSpring Intent Personas? What are PushSpring App Genre Audiences? App Genre Audiences allow you to target users by types of apps they own, and count of apps per genre. Identify user affinity by app category, and drive efficient app install performance. What IDs does PushSpring collect / use for targeting audiences? PushSpring data is tied to anonymous, resettable, and opt-out enabled advertising IDs associated with user devices (IDFA for iOS and Android Advertising ID for Android) to create fully permissioned, aggregated and anonymous behavioral audience segments. What kind of scale does PushSpring offer? How many targeting audiences does PushSpring offer? PushSpring offers over 250 standard Personas along dimensions of Life Stage, Interest & Activity, and Intent. 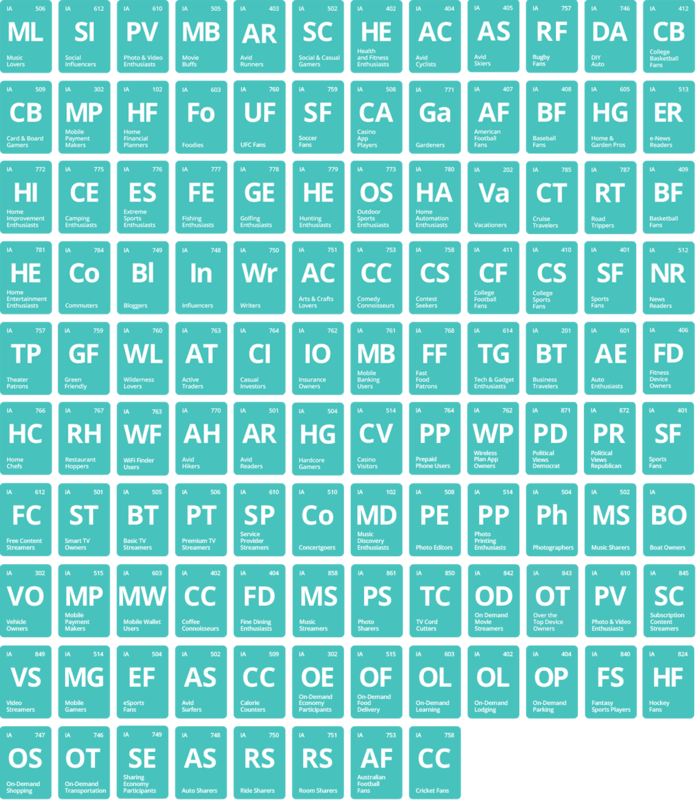 Additionally, PushSpring App Genre audiences classify users by the count of apps owned by genre, across 19 genres, and within Games, 19 sub-genres. Demographic and custom audiences are also available. How many unique users does PushSpring offer? PushSpring offers over 300M unique mobile IDs, across the United States, Canada and Australia. How does PushSpring collect data? PushSpring audience data is collected from trusted, compliant sources, including PushSpring SDK implementations with mobile app publishers and strategic 3rd party partnerships. PushSpring does not collect any personally identifiable information, only anonymous data tied to resettable device advertising identifiers. PushSpring is a member of the IAB and the DAA Self-Regulatory Program, and we take numerous steps to ensure that all data collection is performed in compliance with posted Self-Regulatory Principals for Online Behavioral Advertising and Self-Regulatory Principles to the Mobile Environment. Which special features does PushSpring offer to support my targeting goals? The PushSpring Lookalike Segment Expansion Tool allows you to assess your custom segments, and expand, with accuracy safe-guards in place. Lookalike audiences are offered at no additional cost and are available for analysis and activation within 30 minutes. Cross Device Audiences can be used across in-app, mobile web, display, and video inventory. Cross Device audiences launch at no additional cost and run across PushSpring preferred partners, including The Trade Desk, TubeMogul, MediaMath, DBM, YouTube and others. How do I get data in and data out of the PushSpring Audience Console for non-targeting related needs? Import first party data into the PushSpring Audience Console. View app-based insights, create segmentation strategies, and build lookalike audiences. 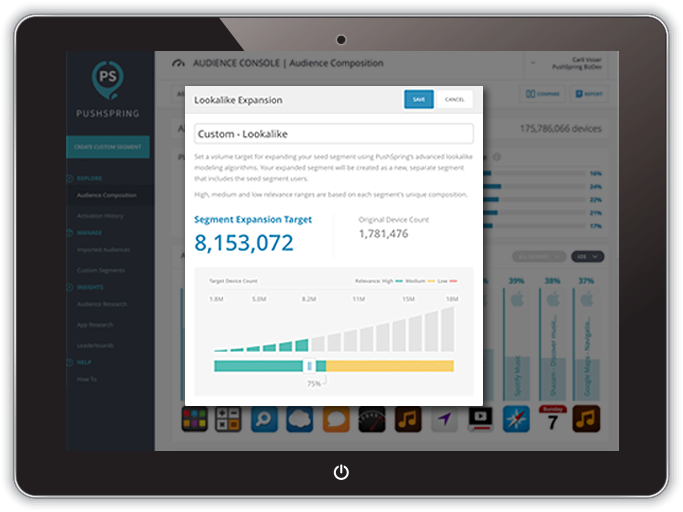 With the PushSpring Audience Console you have the option to export Audience Composition Reports, taking the data out of the console and into your customer presentations. Reports are available in PDF, PowerPoint, and CSV format. Can I access PushSpring Audience Data outside of the PushSpring Audience Console? Use PushSpring Personas, available across the programmatic ecosystem on the buying platform of your choice, to reach highly curated audiences.